The Yellow Page industry is at a serious crossroads – print still works well for most publishers in rural markets, and digital products both online and mobile are obviously growing in popularity. Some publishers, like the Yell Group, are abandoning any link to “yellow pages” by adopting company names like “hibu” so the look/sound more relevant in this “SoLoMo” advertising world. Add it up, and the industry has the feel at times that it’s just drifting without a clear direction or future. That’s very unsettling to those of us that look to the industry for their living. So at a time where the industry needs a serious shot in the arm, I have a suggestion — we need to bring back the core brand that made this industry the stalwart it has been for 120+ years or so. I am suggesting we bring back the Yellow Pages “Walking Fingers” logo and begin promoting the heck out of it. But with one key caveat – we should update the message to reflect the value this industry does provide is now in print, online, and mobile formats. No matter the physical platform, your fingers are still doing the walking on your phone, on a keyboard, or through the book. To this day, it is still one of the most widely recognized brands out there. Its origins go back to the early 1960s when Henry Alexander, graduated from the Swain School of Design in New Bedford, Massachusetts, began a successful freelance career as an illustrator and commercial designer. Alexander created the first “Walking Fingers” symbol for the New England Telephone Company in 1962. As all of the Telco publishers were still part of one regulated monopoly – the AT&T Bell System, it only took about a year before AT&T and each of the regional telephone companies that made up the Bell System started using the symbol on their telephone directories. The symbol became instantly recognizable. A new Let Your Fingers Do The Walking campaign ran during the 1970’s. This campaign kicked off the process of raising awareness of Yellow Pages as a brand and introduced the Walking Fingers logo encouraging every American household to “let your fingers do the walking” through the Yellow Pages. Both the symbol and the slogan were seen for years by millions of people in national advertising campaigns. In some countries, the familiar “walking fingers” logo is not protected as a trademark and may be used by anyone. In other countries such as Canada, the logo and even the concept of “yellow pages” has been severely restricted to use by just the Telco affiliated publisher. In the mid-90’s what was then the Yellow Pages Publishers Association (YPPA), had several board members that became concerned that Yellow Pages had lost some of its mojo to other advertising media. 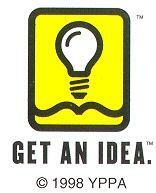 In an effort to gain a fresh look, the Association had its publishers members move to a new (trademarked this time) logo with a lightbulb and the tagline, “Get an idea”, instead of the walking fingers. Unable to achieve any significant traction with the new branding (traction that could be verify through higher sales) the “Get an Idea” campaign was abandoned two years later. The Yellow Pages “Walking Fingers” were back, albeit in a smaller scale, and are still being used by most publishers. The original symbol and tagline is so deeply ingrained in the minds of American consumers and businesses, and so iconic, that no other symbol of Yellow Pages directories has yet to gain an equivalent status. What’s old, is new again.. So why should we bring the walking fingers program? We are still the one advertising media that connects buyers to sellers. The iconic walking fingers still reflect that core mission of the industry products. It’s a logo and tagline you don’t have to explain – most people already get it which makes re-implementing it a lot easier than selling some new concept from scratch. For the update part, the messaging should be that we are still using our fingers when we shop, it’s just that sometimes it’s in a book, or on a mobile phone, or on the keyboard to access the internet, or flipping pages on an ipad. But at the end of day the motion is the same. Announcing a return to the walking fingers wouldn’t necessarily requires a huge, expensive new marketing campaign, IF….each publisher agreed to promote it together in their local market. What do you think? Should we bring the walking fingers back as the generic industry symbol??? This entry was posted in Editors Corner and tagged get an idea, print yellow pages, walking fingers logo. let your fingers do the walking, yellow page branding, YP Talk, YPPA. Bookmark the permalink. Having worked for advertising agencies, I can affirm that ad agencies tend to prefer something new (as in, invented in their shop) versus something that has a history of working just fine. It is amazing how many companies and industries abandon a brand or marketing theme that has a huge amount of value for something new with little or no value; they are throwing millions and often billions of dollars of goodwill out the window. If anything, I might suggest substituting the word “driving” with “walking” in order to position us as pro-environment rather than (as many incorrectly see) anti-environment and to better reflect how we shop – driving rather than walking – and to establish ourselves as part of the future rather than the past (saving fossil fuels, reducing pollution). In any case, this industry needs, now more than ever, a powerful message and “Let your fingers do the walking” resonated among consumers. Very few marketing capaigns became ingrained in the minds of the general population. This was one of them. We shouldn’t throw it away. I personally think it is a great idea, so much so I did it ! I totally disagree! The walking fingers logo has cost thousands of business owners millions of dollars in waste because of the bogus billing issues associated with the logo. It’s tarnished beyond repair and a new logo and branding of yellow pages would be needed. Business owners do not trust the logo anymore. Don’t get me wrong, I’m a huge yellow pages fan and user, even though sometimes I go to the mobile first instead of yellow. I just don’t think it’s time to revive the walking fingers. It’s time to move forward, not backward. Lisa: Thanks for your comments, but I’m not sure where the source of your comments is coming from. I am in the market each week with reps and have never heard this complaint come up from a single SMB. Yes, there has always been some bogus Yellow Page efforts ever since the product was first invented, but never to the level you are talking about. If you want to do a fair comparison, let’s look at the level of click fraud compared to bogus Yellow Pages. The online side has a much bigger problem to deal with. The other key point you may have missed in my article is that the industry is not in a position to muster a huge, expensive media campaign to push some new symbol or tag line. By reviving the walking fingers concept, the industry can immediately capitalize on an iconic symbol that already has huge awareness and trust associated with it. You don’t stop making Rolex watches because of a few counterfeiters ! Let’s get rid of the U.S. Flag because some people burn it too ? Hmmm. Yellow and the Walking Fingers is as American as it gets, you should move forward and get over it if you got burnt by bad people, not the Logo. I agree and while we are at it why not bring back the truck decals with the advertiser’s name on it. Advertiser wins, YPs win all over town.